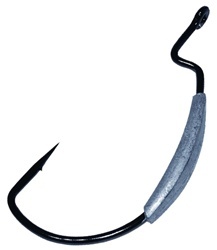 Gamakatsu’s “EWG Monster” was developed for it’s evolution into the big hook craze. The “EWG Monster Weighted” is going to be a part of the revolution of Big, Weighted, swim bait hooks! Developed with a heavy wire, and high carbon steel, to give it the strength needed for that positive hook setting power! Designed with a slightly higher hook point needed to accommodate the use of larger and thicker baits used to catch those big bass! But here’s what makes it such a great hook, and a leader in the swim bait revolution. It has been designed with strategically placed weights varying from the 1/4-3/8oz.